Maybe you were working late. Maybe you slipped on your way to the restroom or strained your back while lifting a patient. Maybe years of job stress make it difficult to bend your knees. Maybe a heavy load fell on you from above. Whatever happened, you were injured at work, and now you must deal with the consequences. Workplace accidents can happen to anyone at any job. When it happens to you, you need an experienced attorney to ensure that you get the compensation you deserve. At Elk & Elk, we have been helping people just like you for decades. We have won some of the largest injury settlements in Ohio, so our track record speaks for itself. Let us help you get the support and stability you need to recover. Call for a free consultation. It costs you nothing to talk to us, and you’re under no obligation: 1-800-ELK-OHIO (1-800-355-6446). What kinds of accidents happen at work? These are less severe than many workplace injuries, but they can still cause a person to miss work. Overexertion typically causes sprains and strains, though they can also result from improper technique while pulling, pushing, bending or lifting. Industrial workplaces can expose employees to unsafe levels of light and sound, resulting in permanent hearing or vision loss. Other causes of vision and hearing problems include exposure to chemicals, explosions and motor vehicle accidents. Severe blows to the head can result in traumatic brain injuries, skull fractures and other kinds of disabling injuries. These can happen during falls from above, explosions, motor vehicle accidents or catastrophic equipment failure. Some injuries are not apparent until you have been doing a certain job for many years. The accumulated strain from performing the same motion over and over can eventually cause carpal tunnel syndrome, arthritis, wrist injuries and other related conditions. These injuries can happen with many kinds of equipment, especially on construction sites or in Cleveland’s warehouses and factories. While some cuts are minor, others are quite serious and can keep a person out of work for days or even weeks. This can happen with a simple fall, but it can also result from a work-related car accident, industrial equipment accident or other scenario involving blunt trauma. 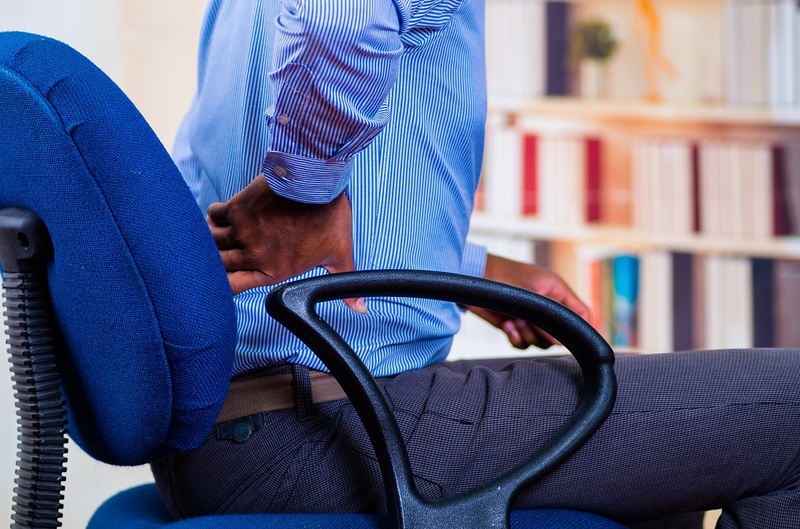 Many workers injure their backs in the course of their job duties. This can happen because of repeated twisting, bending and other repetitive movements. Back injuries can also occur in sudden accidents such as falling or slipping. How long do I have to report an accident? If you are injured in a workplace accident, you should report it to your supervisor immediately. If you wait too long, your employer may come to believe that you fabricated the story and the Bureau of Workers’ Compensation (BWC) may agree and deny your claim. When it comes to the actual workers’ compensation claim, Ohio gives you one year from the date of injury to file. What kind of compensation can I receive for my injury? The compensation you are eligible for will depend on what kind of claim you file. An important note is that workers’ compensation benefits do not include anything related to pain and suffering or a decrease in your ability to enjoy life. Also, if an employer was negligent in causing the condition that led to your injury, workers’ compensation will not address that either. Because of these restrictions, some people choose to pursue a so-called “third-party” lawsuit against their employer, the manufacturer of defective equipment or another person that caused their injury. Third-party claims are especially prevalent in the construction industry, which involves many contractors and outside workers. This question has a two-part answer. If you are pursuing benefits under workers’ compensation, fault does not matter — Ohio’s no-fault system means you can receive benefits regardless of who was to blame. Even if you were careless or played some role in your own injury, that does not invalidate your claim. However, some people pursue third-party lawsuits in addition to workers’ compensation. For instance, if you were using a drill at work and the drill bit broke and injured you, you may have the option of bringing a lawsuit against the drill manufacturer that is separate from your workers’ compensation claim. With third-party lawsuits, fault does matter. The burden of proof is higher, since you must show that the company, a person or another party was negligent in how it behaved, and that this negligence caused your injury. Establishing this requires gathering evidence, interviewing witnesses, procuring medical records and reviewing all other kinds of documentation available. Can my employer retaliate against me for filing a claim? No. Retaliation against injured workers is illegal in Ohio. If you experience demotion, harassment, job loss, intimidation, decreased wages, discrimination or any other adverse effect as a result of filing an injury claim, speak with an attorney immediately. The law does not allow this behavior and your employer can be held liable in court. Time is of the essence with workplace injuries — the sooner you contact us, the sooner we can help you meet critical deadlines in your case. Consultations are always free, and we will not charge you unless we win your case. If you would like to speak with our legal team, you can reach out by email or by phone: 1-800-ELK-OHIO (1-800-355-6446). We represent injured workers in Cleveland and throughout Ohio.